Girl with a Pearl Earring (2003) – Read the Film Review and the travel post about my film‐inspired trip to Delft! Tulip Fever (2017) – Read the Film Review here! 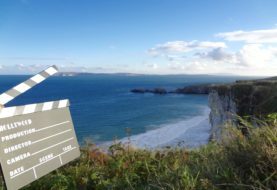 Dunkirk (2017) – Read the Film Review here! Scene from "The Fault in Our Stars". Photo: James Bridges/TM and © Fox 2000 Pictures. If you want to see the famous Dutch tulips in their full splendour, the spring season (March‐May) is the best time to go! The summer months (July‐August) could get quite crowded as many Dutch people are on annual leave, too. However, these are generally the warmest months of the year. The capital of the Netherlands offers a lot in terms of historical buildings, unique sightseeing attractions and world‐class art. 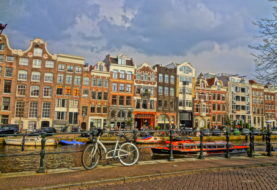 As such, Amsterdam is certainly the most popular city to visit in the Netherlands. This pushes up the prices, too, so just bear in mind that you have to book early and shop around a bit to get good deals on accommodation. Read more about visiting Amsterdam in my 24 hours in Amsterdam post. All of these cities are very close by. Just jump on a train and you are (almost) there. Utrecht and Leiden are not far either. In such a small country, the coast is never far away either. Even big cities like The Hague or Amsterdam have their own beach front. You can easily get to Scheveningen (the beachfront of The Hague) by hopping on the city tram. In the summer time, you can get to Zandvoort (the beachfront of Amsterdam) via a direct train that takes about 25 minutes. At other times, you just need to change trains once in Haarlem. The Dutch West Frisian Islands up in the North are worth a visit, too. Lonely Planet even called the island of "Texel" one of the ten top destinations in Europe in 2016! Finally, the closed off inland bay called "IJsselmeer" is great for sailing trips and has served as a filming location in the war drama Dunkirk (Moonstone scenes at sea). Three ways of getting around in Delft during the evening rush hour: The bicycle, the scooter and… something else! By bicycle: If you want to live the local way of life, rent a bicycle. Just bear in mind that in the Dutch are known as the most frequent bicycle riders in Europe, so you'll definitely have to share the road. Remember that cars and bicycles drive on the right hand side of the road (just like everywhere else in Europe EXCEPT for the UK and Ireland). It's also wise to always ring your bell if you approach a pedestrian from behind (better one time too much than one time too little). By train: The Netherlands are a very small country (300 km from North to South and 180 km from East to West), so many towns and cities are within easy reach of each other. The Dutch train network is fast, affordable and well connected to its neighbouring countries. From my German home town Osnabrück in Lower Saxony, for example, you can take a 3 h direct train to Amsterdam. Book in advance and get the Europe "saver ticket" from DB Bahn. Train tickets for travelling between cities in the Netherlands can be booked on the Dutch train company website Train – NS. 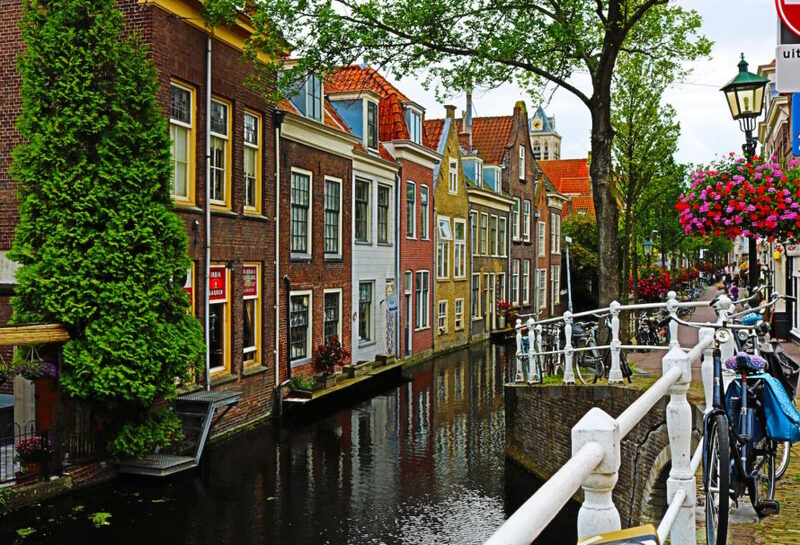 Walking: The smaller towns (such as Delft) are easily explored by foot. Just watch out for those speedy bicycles! By Tram and Bus: By tram, you can get from Delft to The Hague in 30 minutes (a day ticket cots 6.50 € and is valid on all busses and trams in The Hague, too). You'll find an equally good network of trams and busses in cities Amsterdam or Rotterdam. 1. Watch out for those bicycles! As mentioned above in "How to get around", Dutch people (together with Belgium people) are the undoubted kings and queens of cycling, so almost everyone will cycle everywhere, including to and back from work. Be careful to always look left and right before you cross a street or bridge. Especially in the morning and evening rush hours, the next bicycle might rush by in the blink of an eye! As a members state of the European Union, the official currency in the Netherlands is the Euro (€). Credit cards are accepted in most places. However, unlike in the Scandinavian countries, where you can pay (literally) everywhere by card, it can happen in some (and especially more rural) places that cash might be the only form of payment accepted. Therefore, it's always wise to carry some cash with you when travelling in the Netherlands. Tipping practises are similar to other European countries. At restaurants and when using taxis, you usually "round up" the bill. However, in self‐service places or if the service was bad, there is no obligation to tip. … including the so‐called "soft drugs" like Marihuana, are illegal in the Netherlands! The so‐called "Coffee shops" (introduced about a decade ago as an attempt of the Dutch government to make the controlled consumption of small quantities of Marihuana legal), can still be seen every now and then (especially in Amsterdam). However, since 2013, foreigners are no longer allowed to enter these and in the long term, all “Coffeeshops” are set be converted into clubs, of which only Dutch citizens over the age of 18 can become a member. Because the police has become a lot stricter since then, it's advisable to stay away from any kind of drugs when travelling to the Netherlands.